Dr. Cao grew up in Wayland, MA. Throughout high school and college, she worked as a ceramist at a dental laboratory where she discovered her passion for dentistry. After earning her Bachelor’s degree in Psychology from Brandeis University, Dr. Cao moved to Buffalo, NY to attend dental school at the State University of New York at Buffalo School of Dental Medicine. She graduated with a minor in esthetic dentistry and was recognized by the Academy of Operative Dentistry for excellence in clinical care. 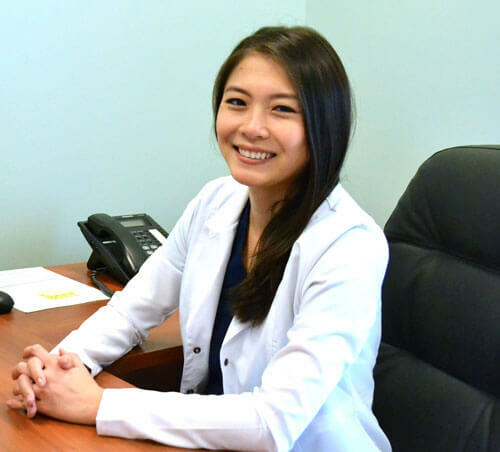 Upon graduation, Dr. Cao was accepted into a General Practice Residency program in Brooklyn, NY where she trained extensively in comprehensive general dentistry for patients of all ages. Dr. Cao is dedicated to continuing the high standard of care that Tyngsboro Family Dental Practice has provided the community. She is skilled in all phases of dentistry and is a certified Invisalign® provider. Dr. Cao is a member of the American Dental Association, the Academy of General Dentistry, and the Massachusetts Dental Society. In her free time, Dr. Cao enjoys crafting, traveling with her husband, and spending time with friends and family.